1. What is the class format? The class format consists of quizzes, discussions, blog reports, midterms and a final exam. Monday will begin with a pre-quiz, lab intro and the start of the lab itself. During the Wednesday's class period we will continue the lab if it is not completed. Friday's class will have blog discussions and a post-quiz. 2.What are the important safety rules? Everyone must know where the fire extinguisher, first aid kid, telephone and the list of emergency numbers. Every group must test if the equipment is working properly. 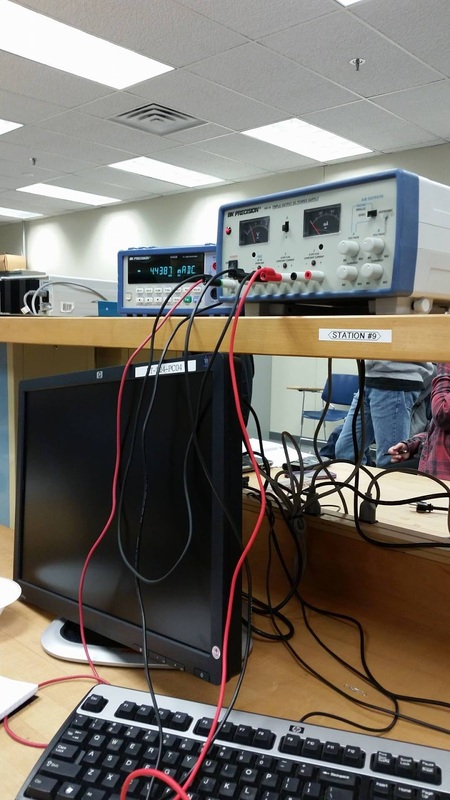 When conducting the lab it is safest to power everything off when not working, ground the circuit and don't have wet hands. After you are done with the lab clean and tidy up your work station. Yes when the amperes is between 0.1 and 0.2 it could cause death. Lower amperes will cause some pain and breathing troubles along with shock, muscular paralysis but this will not cause death. 4.How do you read color codes? 5.What is the tolerance? Give an example from your experiment. Tolerance is the percentage that the resister could be off. If the resistor has a 5% tolerance and a value of 470, the reading could be 5 percent higher or lower than 470. 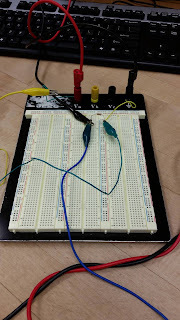 6.Prove all your resistors are within the tolerance range. 1. What is the difference between measuring the voltage and current using a DMM? Why? Measuring the voltage we are able to get a value by putting the probes on the two ends of the what we are measuring, Calculating the current we will have to break up the circuit to get a current value. 2. . How many different voltage values can you get from the power supply? Can each one of them be changed to any value? Using the triple output dc power supply we are able to get 3 voltage values. One of the channels is a fixed 5 volts. The other two channels A and B are able to be changed from any voltage ranging from 0 volts to 24 volts. Ohm's Law is voltage equals the current multiplied by the resistance. By getting the current and the voltage we are able to use this formula to get a resistance value. 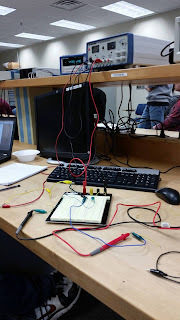 The circuit could be implemented in one of the middle stages of the Rube Goldberg machine by using a physical component to block the photo-resistor. When the physical component was moved it would start the motor which could be attached to another component to start physical movement for the next stage of the Rube Goldberg machine. - Tolerance ranges could have been presented better. - You needed to show a drawing of a Rube Goldberg design.